7 Should you buy it? Slightly over a year ago, I reviewed Anker's first Android-powered portable projector, the Nebula Mars. 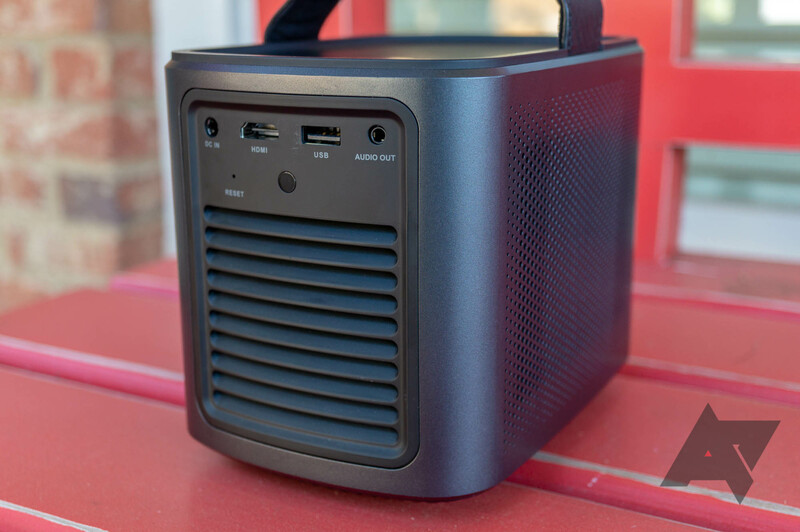 It packed a bright projector and JBL speakers into a small package, and the $599.99 price reflected that. The heavily-modified build of Android 4.4 worked decently well, but app compatibility was limited, since most apps have stopped supporting KitKat. 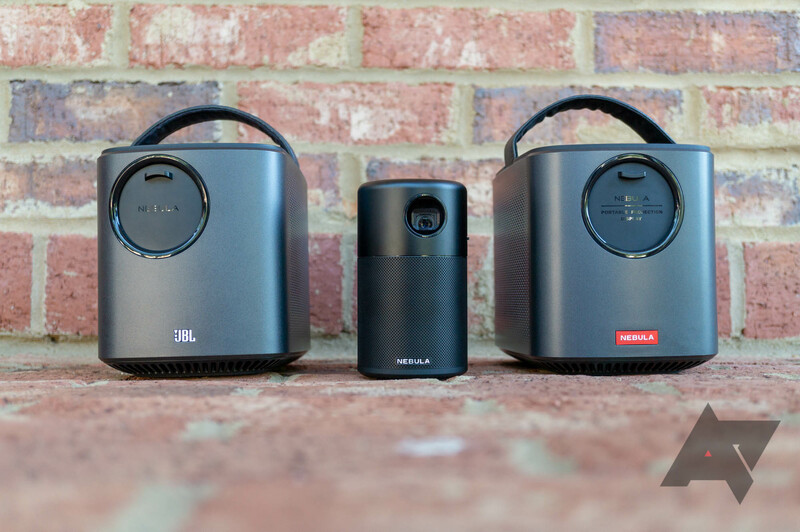 Anker then released the $350 Nebula Capsule, a smaller (and dimmer) projector that doubled as a Bluetooth speaker. It was more expensive than competing devices, but it was also much better than all of them. The excellent build quality, decent projection brightness, and newer software (based on Android 7.1) made it a great product. Now we have a successor to the original Nebula Mars - the aptly-named Nebula Mars II. It's a mix of the Mars I and the Capsule, with the best features of both. The software experience still isn't without problems, but it's a solid product overall. Bluetooth Just like the Nebula Capsule, the Mars II doubles as a Bluetooth speaker. Battery The Mars II lasts around four hours on a single charge, or 30 hours in Bluetooth speaker mode. Software It runs full Android 7.1 Nougat. Software (again) There's no Google Play Store, most apps don't have a TV interface, and you have to use a remote control app on your phone in many situations. Remote Having a touchpad on the physical remote would make using non-TV apps much easier. The Nebula Mars II looks nearly identical to the original projector. It's a small black box, measuring in at 7 inches (17.8 cm) from back to front and 4.8 inches (12.2 cm) tall. On the front is the projector lens, with a cap that slides up and down. Sliding the cap down turns on the Mars II, and sliding it back up turns the projector off. There's an embossed Nebula logo near the bottom, where the JBL branding was on the original Mars. One of the main selling points of the 2017 model was its integrated JBL speakers, but the Mars II uses Anker's own 10W stereo speakers. The sound quality is still great, and the Mars II can get very loud. On the top of the unit are some controls, so you can still perform most actions without reaching for the remote. There's a directional pad for use with TV-optimized apps, volume up and down buttons, a back button, and a toggle for Bluetooth mode (which I'll explain later on). The back contains an air vent and a few useful ports. There's a DC connector for power (sadly, no Type-C), an HDMI input, a USB 3.0 port, and an audio-out jack. 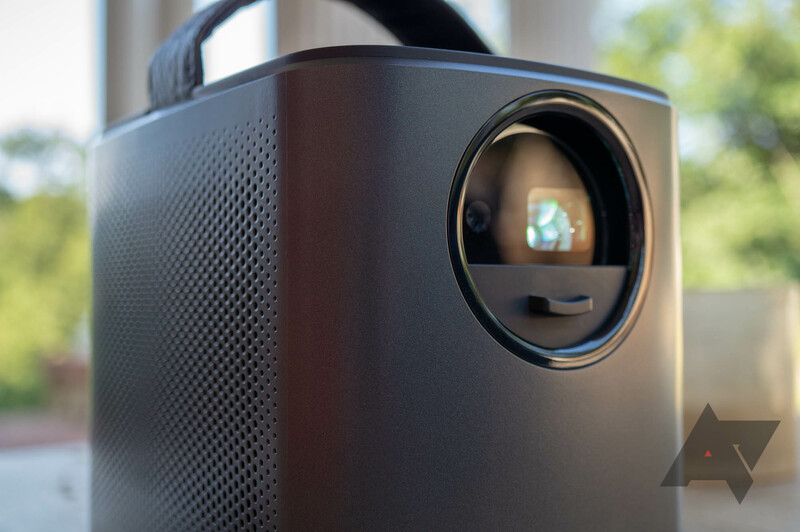 Just like with Anker's other projectors, you can connect an external streaming stick, game console, or other HDMI device to supplement the projector's functionality. The USB connector is primarily for playing media stored on a flash drive, but it can also power a Chromecast or other streaming stick. The included remote is pretty simple. It has a directional pad, buttons for back/menu/home, and volume controls. There's also a mouse button, which Anker has brought over from the Nebula Capsule. When you press the mouse button, a cursor appears on the screen that you can move around using the directional pad. This means you can use (most) Android apps intended for touchscreens, albeit in a slow and clunky way. The remote uses two ECR2032 batteries, which are included in the box. Most people don't have them stocked like AA and AAA batteries, but they're fairly cheap. If the remote dies unexpectedly, all the controls can be found on the top of the projector, minus the mouse button. My main complaint is that there is no touchpad for using apps without a TV interface. 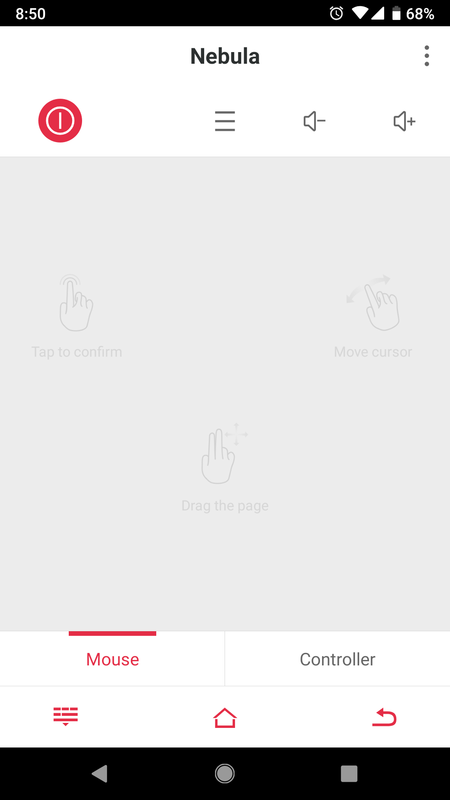 Moving a cursor around the screen using arrow buttons is clunky at best, and incredibly frustrating at worst. Having a touchpad on the physical remote, like these products, would make a world of a difference in usability. 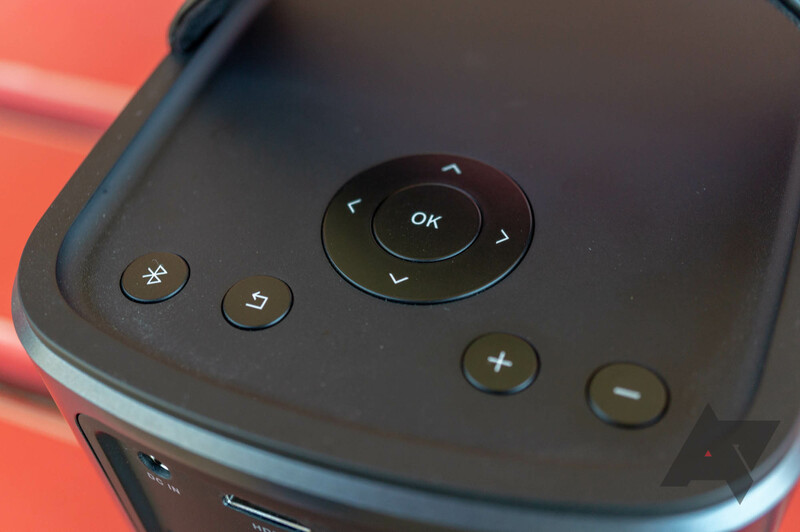 As a final note, I'm glad Anker went with a normal plastic for the Mars II remote, instead of the soft-touch material that the Nebula Capsule's remote had. The latter's remote was already showing signs of wear after a few weeks. The Nebula Mars II has a projection lamp with a brightness rating of 300 ANSI Lumens. That's a notable step up from the Nebula Capsule (100 ANSI Lumens), but it's dimmer than the original Mars (500 ANSI Lumens). Anker told us this was done to give the Mars II a lower price point. The projection quality is definitely still better than the vast majority of portable projectors, most of which are only around 100 ANSI Lumens. In real-world testing, it's noticeably brighter than the Nebula Capsule, but you'll still need to be in a dark room for movies (and dark scenes in particular) to be clearly visible. The projection resolution is 1280x720, which honestly looks fine when sitting a few feet away. Like Anker's other projectors, the Mars II supports digital keystone correction, but it also has something not found on any other Nebula product: auto-focus. On the Mars I and Capsule, you have to manually adjust the focus every time you move the projector. On the Mars II, you don't have to do a thing. Overall, the Mars II is very good as a projector. It's not as bright as the original model, but I think that's a perfectly acceptable tradeoff, considering this is $170 less (at the time of writing) than the first Mars was at launch. Auto-focus is a nice bonus, too. As far as battery life goes, Anker estimates the Mars II will last around 4 hours. In my testing, the projector usually died just before the 4 hour mark. That's about an hour longer than the original Mars could last on a single charge - likely thanks to the dimmer lamp. If you read our review of the Nebula Capsule, I'm going to sound like a broken record in this section. The software on the Mars II is nearly identical to the Capsule's. To start with, it's running the same heavily-customized build of Android Nougat. 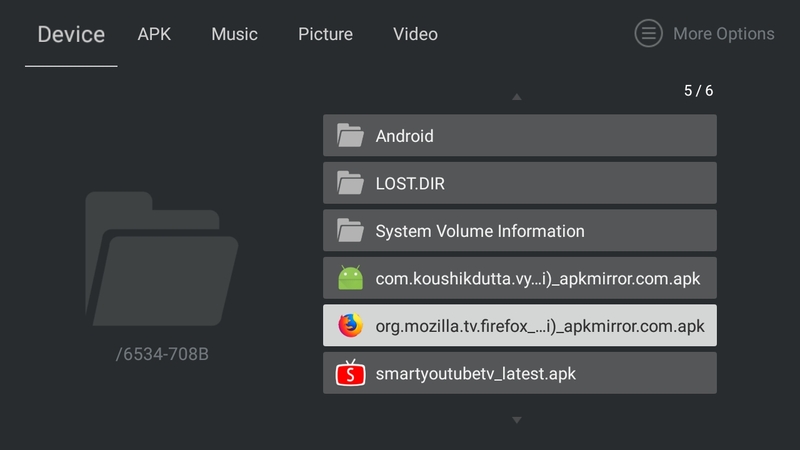 Not Android TV, just normal Android Nougat. Anker has done an admirable job building its own big-screen interface, but it's not a perfect replacement for Android TV. 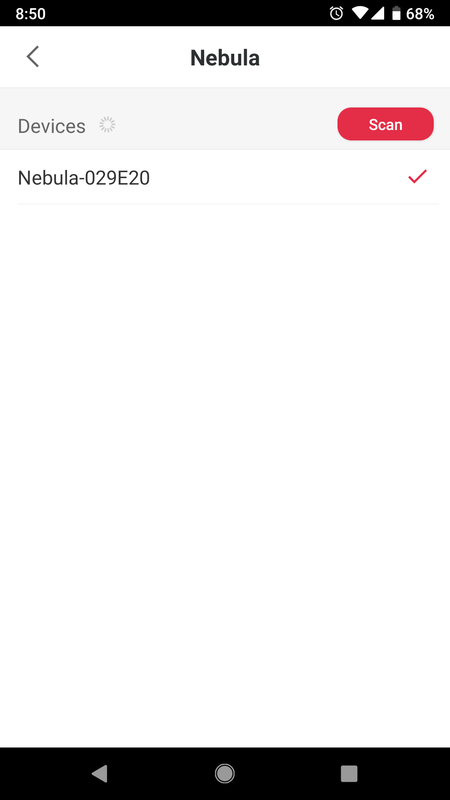 You can't use the Nebula as a Chromecast target, for example - only AirPlay and Miracast are supported. I wasn't able to get Miracast reliably working with my Windows 10 PC, so your mileage may vary. 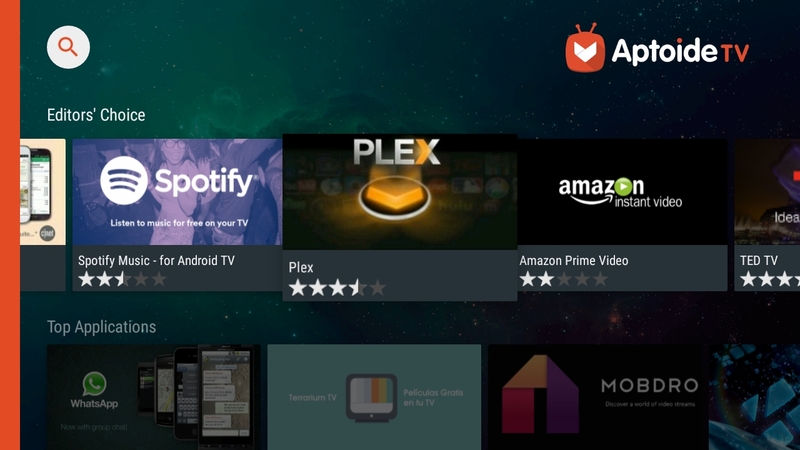 As with Anker's other projectors, there is no Google Play Store, so everything have to be downloaded from the Aptoide TV store. 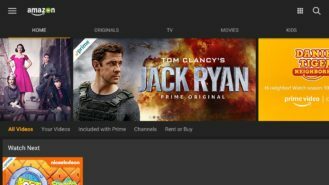 Hulu, YouTube, Spotify, Plex, Amazon Prime Video, Kodi, and others are available. 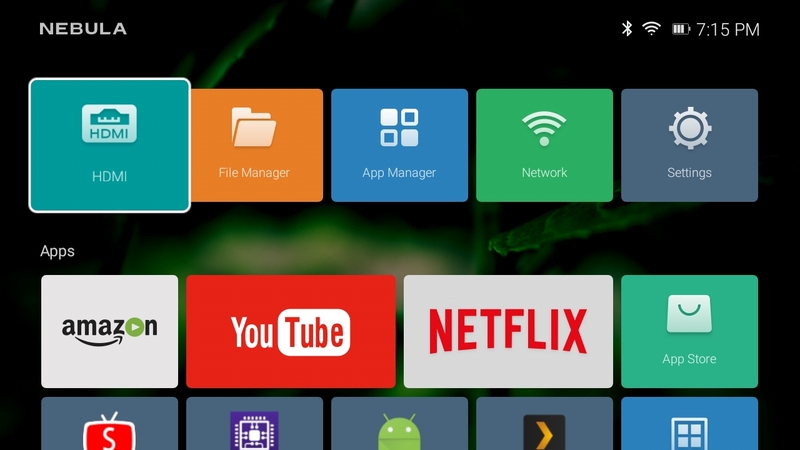 A few of these are designed for Android TV, but the majority are just smartphone apps. The remote's mouse mode and the Nebula Connect app (which I'll get to in the next section) help usability, but at the end of the day, apps designed for touchscreens will never work well with a remote. 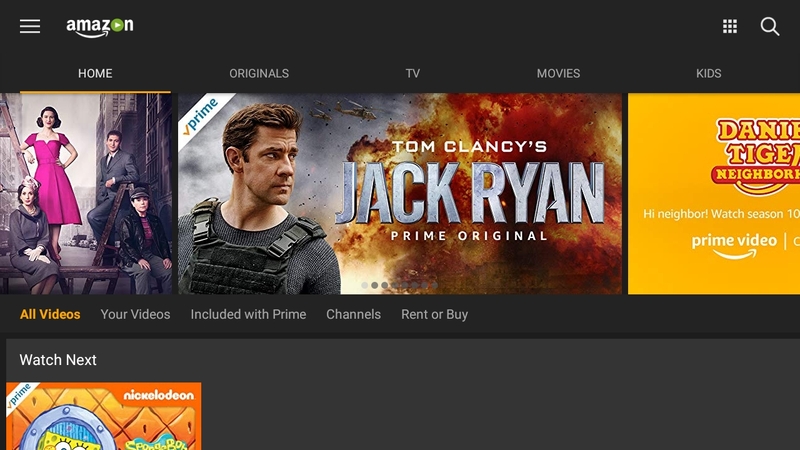 As an example, the Amazon and Netflix apps included with the Mars II are the phone versions, which don't work with the directional pad at all. 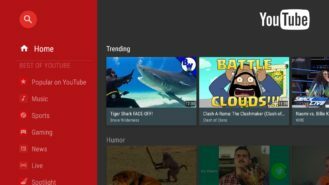 The YouTube application is the old Android TV version, but you can't log in to your Google account, because Play Services is absent. I have no idea why Anker didn't make a simple web wrapper for youtube.com/tv, since that doesn't require Play Services at all. 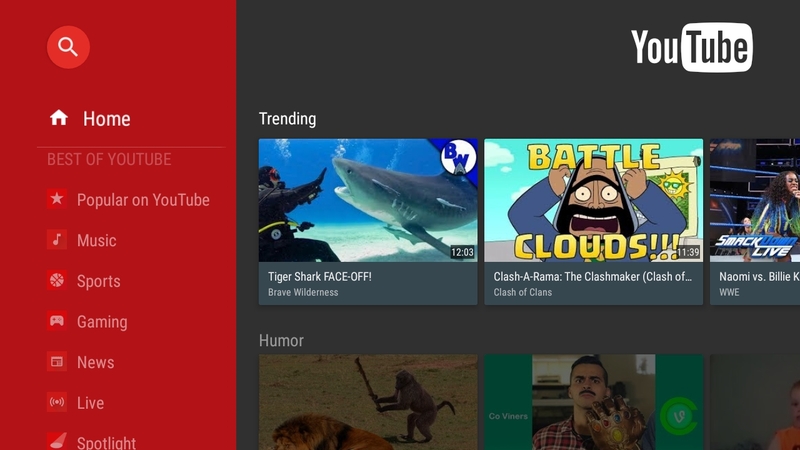 I ended up sideloading 'Smart YouTube TV,' which works perfectly. As with earlier Nebula projectors, you can copy APKs to a flash drive and install them using the File Manager. If the app you want isn't available on Aptoide, you can try downloading it from APKMirror. This is definitely a nice option, if only for unconventional use cases; I installed Vysor so I could grab the screenshots for this review. 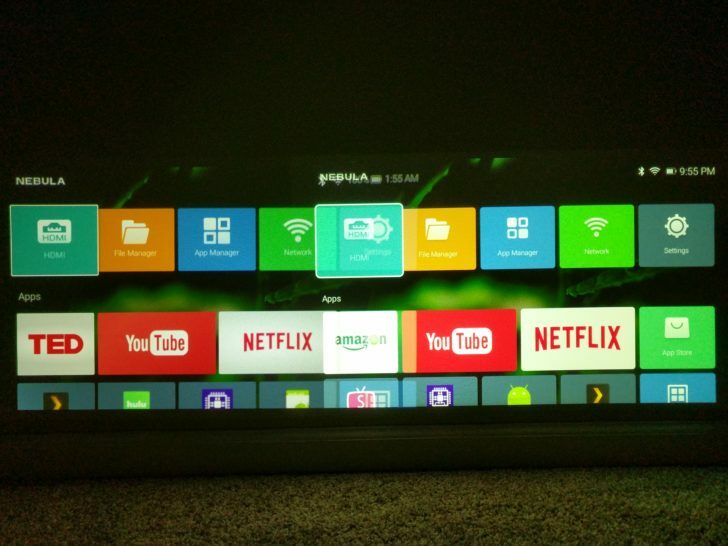 In summary, while the Mars II can technically run most Android apps, many are a challenge to use with the remote. 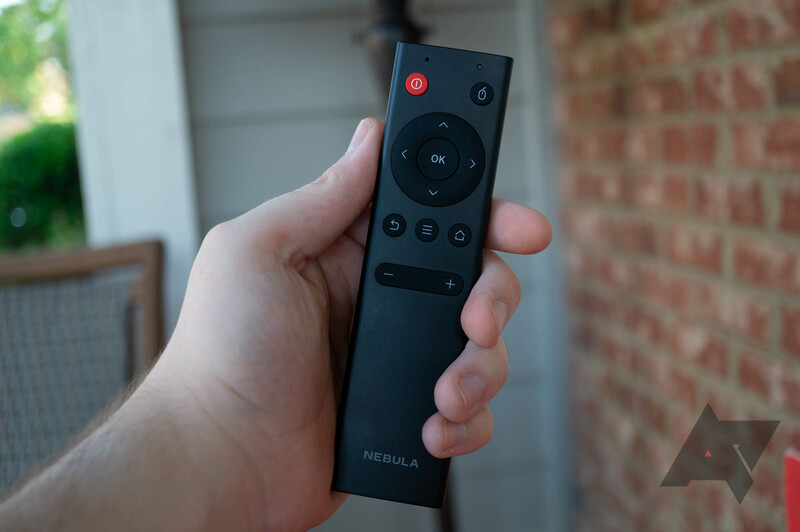 Plugging in a Chromecast or Roku stick can provide a better media experience, but at that point, you're better off buying the cheaper Nebula Mars Lite (which has no OS built-in). 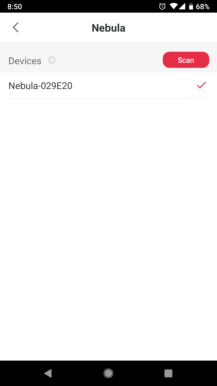 The best way to use non-TV Android apps on the Nebula Mars is with the optional Nebula Connect app, which is available for both iOS and Android. It turns your phone into a wireless trackpad and keyboard for the Mars II, and also provides volume and power controls. Once you are connected, a cursor appears on the projector, as seen in the below screenshot. 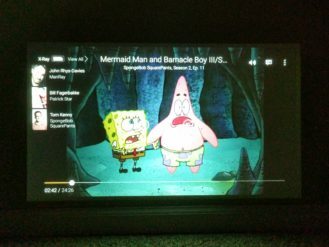 Nebula Connect works exactly as advertised, and it only needs a Bluetooth connection, so you can use it anywhere you take the projector. You'll definitely want to install it if you're buying a Mars II. 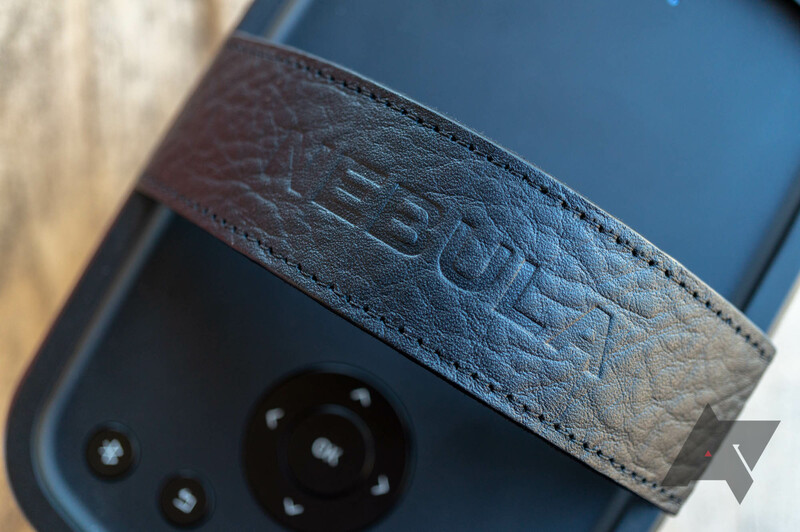 Another feature carried over from the Nebula Capsule is Bluetooth mode. 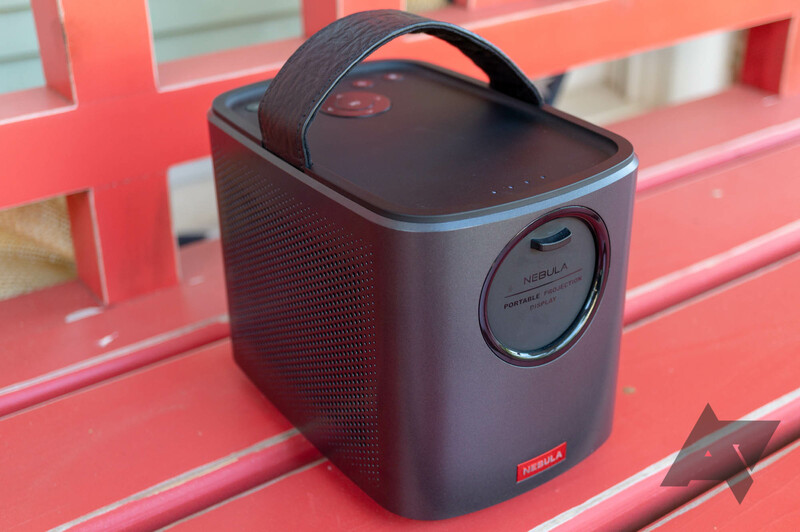 By pressing the Bluetooth button on the top of the projector, the Mars II turns into a standard Bluetooth speaker. Anker estimates 30 hours of battery life in this mode, so you can keep the music going all day (and night, and the next day). This is a nice way to extend the functionality of the Mars II, and the dual 10W speakers definitely sound great. My only real complaint is that the Bluetooth volume doesn't sync up with the speaker volume, so if you want to turn the Mars II all the way up, you'll have to use the speaker's buttons. It depends. 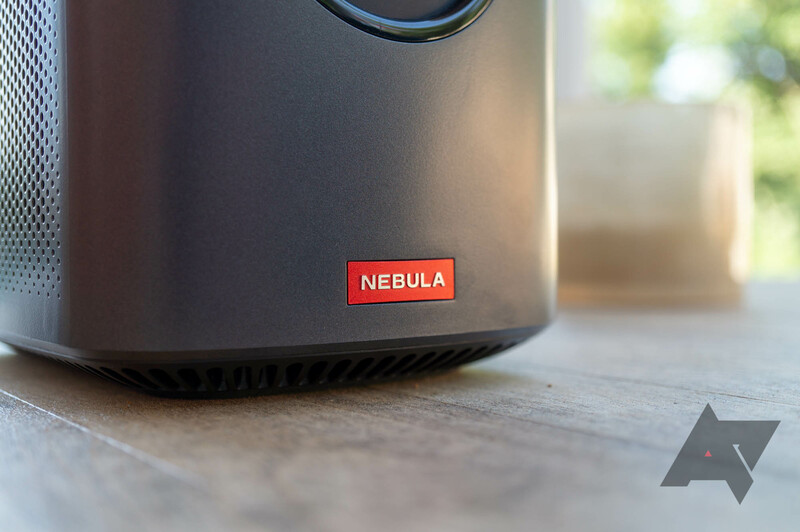 The Nebula Capsule is a darn good portable projector and a great Bluetooth speaker. You can watch movies from a flash drive, stream movies and TV shows from most major services, and play music for hours on end. The choice to use Android is both an advantage and disadvantage. It means the Mars has a massive library of applications, but just about all of them aren't designed for use with a remote. You'll have to use the Nebula Control app in most situations. 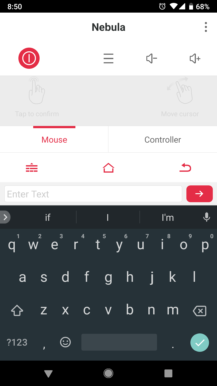 However, Android also allows the Mars II to be incredibly versatile; you could install emulators to play retro games with a Bluetooth or USB controller, or show off presentations at work using an app like WPS Office. 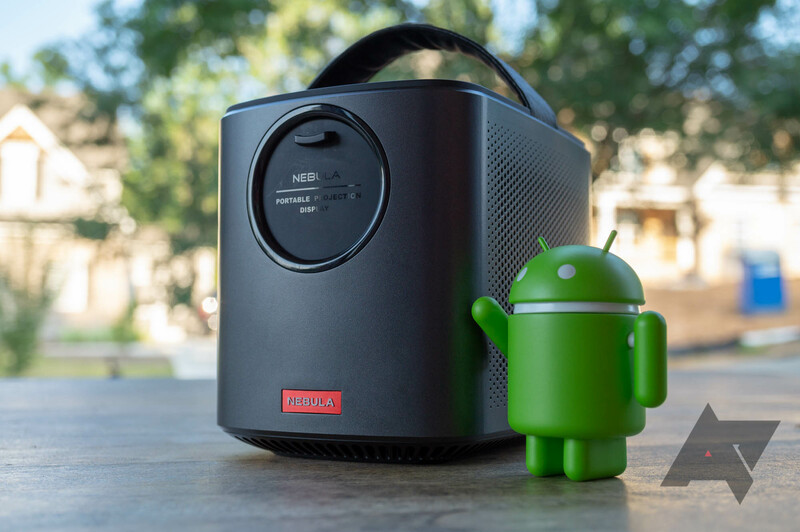 If you really want a projector using Android, and you need something beefier than the Nebula Capsule, the Mars II is definitely the best option on the market. If you just want a nice projector to plug a Chromecast into, the Mars Lite has identical specifications and is cheaper (but lacks Android). 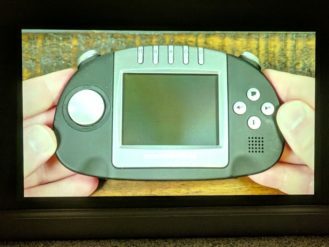 You have $430 to spend on a portable projector, and you really want something that runs Android. You don't like the idea of dealing with optimized apps, or using a smartphone as the main controller.